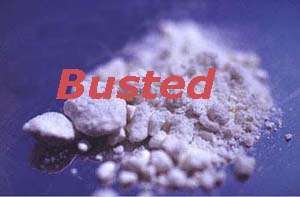 ...Arrested In Alleged Heroin-Smuggling Ring ... Officials Say Men Were Drug Suppliers COLUMBUS, Ohio -- A federal grand jury has indicted two Columbus men on charges of conspiracy to import heroin from their native country of Ghana in western Africa. The indictments against Fred Baah, 44, and Kwame Mitipa, 28, follow a yearlong investigation by local, state and federal agents. Officials said the investigation began with undercover officers making street-level purchases of heroin in communities from Mansfield to Chillicothe. In June, authorities identified Baah and Mitipa as possible drug suppliers to the Columbus area. Through wiretaps, investigators learned the pair was making arrangements for a courier to deliver heroin from Ghana. On Sept. 17, federal agents said they stopped a woman at the Dallas airport as she tried to enter the United States with almost three kilograms -- or six pounds -- of heroin concealed in the lining of clothing in her luggage. Inspectors said they cut into one of 15 African dresses taken from one of the pieces of luggage the woman was carrying and discovered a white powder substance that tested positive for heroin. Laboratory testing later confirmed that the dresses contained 2,833 grams of heroin, officials said. "This indictment indicates that central Ohio had a direct connection to an overseas source of heroin," said Greg Lockhart, United States Attorney for the Southern District of Ohio. "This shows that drug dealing networks can bypass customary source cities such as New York and Los Angeles and reach directly into the Midwest." Conspiracy to import more than a kilogram of heroin carries a mandatory minimum 10-year prison term up to life imprisonment, a $4 million fine, five years of supervised release and a $100 special assessment.